1. I am happy to be here to inaugurate the India International Science Festival 2018, the fourth in a series of such events being organised by the Ministry of Science & Technology, the Ministry of Earth Sciences and Vijnana Bharati. It is appropriate that IISF this year is taking place in Lucknow. This is a city with a long tradition of learning and of scientific research. 2. Even before Independence, the botanist and fossil specialist Birbal Sahni did pioneering work here. His research is symbolised by the Birbal Sahni Institute of Palaeosciences. Prominent institutions such as the Central Drug Research Institute, the Central Institute of Medicinal and Aromatic Plants, the Indian Institute of Sugarcane Research and the Indian Institute of Toxicology Research were set up here. Over the years, Lucknow has become a centre for education and research in medicine – especially at the Sanjay Gandhi Postgraduate Institute of Medical Sciences – as well as inengineering and technology and, most recently, Information Technology. All this makes the city an excellent setting for such a Festival. 3. Science has always been a part of Indian culture. Centuries ago, our ancestors were uncovering the secrets of mathematics and the concept of the zero. They were applying the lessons of science in fields as far apart as medicine and metallurgy. From the Green Revolution to our space programme to the creation of a thriving biotech and pharmaceutical industry, science has driven our post-1947 modernisation. Today, in the first quarter of the 21stcentury, in the age of robotics and precisionmanufacture, of bioinformatics and gene editing, of the Fourth Industrial Revolution and Artificial Intelligence, it is time for a quantum jump. 4. We cannot make that jump without converting science into a mass movement – and without promoting tinkering and innovation as an everyday activity in our labs, our universities and even our schools. Jugaad, cut-paste experiments and frugal innovation have their role. Even so, if we are to transform India into a middle-income economy and an advanced industrial power, we need to upgrade the engines of knowledge creation. 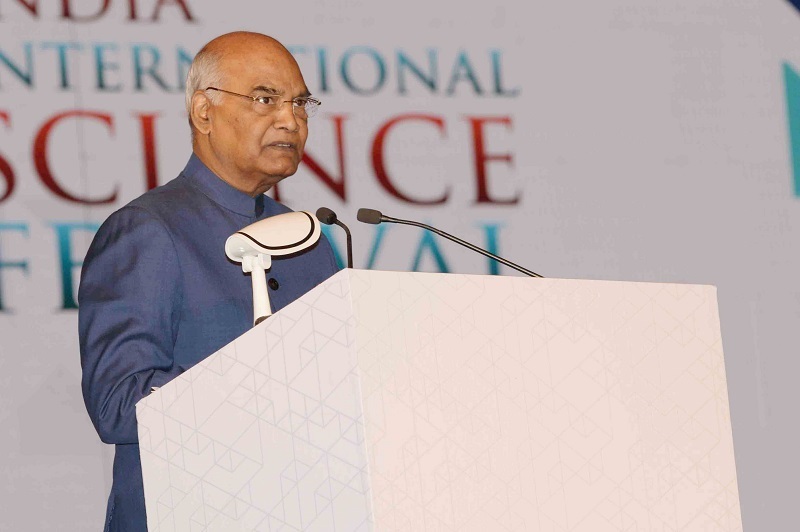 Science and technology are not a mere add-on – their cross-cutting nature and role in every field and in all our flagship programmes and developmental efforts have to be appreciated. 5. Such thinking shapes the policies of the government. Such thinking has led to the putting together of IISF as, if I could call it so, the Kumbh Mela of science. Its sessions cover a spectrum of science-related themes. There is a conclave of science ministers of India and of partner countries. There is a coming together of scientists and technologists from the Indian diaspora to find ways of engaging their skills in Indian research institutions. 6. This is a cross-fertilisation that the government is encouraging. I am happy to note that between 2012 and 2017, 649 Indian scientists have returned from abroad to pursue research opportunities at home. In the previous five years, only 243 scientists had come back. Of course, it is not important where scientists are based. The nature of science is transnational. A few weeks ago, I was at Europe’s leading centre for laser research, located in Prague, in the Czech Republic. Among those contributing to it are Indian scientists based in Mumbai. 7. I am glad to note that this Festival will have sessions on how science can be a catalyst in combating climate change and global warming; in pushing our clean air aspirations; and in giving an impetus to agricultural prosperity as well as public health. These concerns are at the core of the country’s developmental agenda. Each of them is benefiting from scientific innovation. iv. The government’s efforts to enhance farm incomes and productivity are being assisted by chemical analysis of agricultural holdings. The information is then stored in soil health cards and nutrients and cropping patterns specific to the land holding are deployed. This is a boon for our farmers, as indeed are new irrigation technologies. 9. I have given only a few examples. There are so many more and there is so much more to do. The role of science and scientific innovation in our national developmental agenda is expanding day by day. In 2017, patent applications by Indian start-ups rose to 909. This was a 15-fold increase from the number in 2016 – just 61. In 2018, India’s R&D investments will amount to an appreciable US$ 83.27 billion. The government has announced the Prime Minister’s Research Fellowship Scheme. It will promote development through innovation and has a budget of Rs 1,650 crore for seven years beginning 2018-19. These are exciting times for science in India. The resources are now available. It is for our talent pool to respond. 10. Common people relate to science in the form of technological products and solutions. These are, of course, essential to fill many of our societal gaps. However, the obligation of scientists is not simply to create applications for fellow citizens. It is primarily to explore the frontiers of human ingenuity. Blue-sky research and innovation for its own sake, and examining the unknown and undiscovered limits of our universe, represent the magic of science. These have led to unplanned findings with unimaginable implications. 11. This is how science has advanced over centuries. And this is why, even as we marry science to developmental goals, we must not ignore theoretical research. It is for us to ensure that pursuing pure sciences becomes even more of a viable career option in India. This is crucial if we are to build a sci-tech ecosystem. 12. Science is done best when it is a collaborative venture, with resources – including funding resources – and facilities being shared. This is the era of partnerships between research centres and universities. I would urge the scientific community to mentor and to open its doors to budding researchers and students in universities. They look to senior scientists for guidance, support and access to laboratories and equipment. With such generosity of spirit and of intellect, Indian science will carry much greater weight. And it will move closer to building a best-in-class ecosystem. 13. Before concluding, I want to point to one other issue – the distressingly low participation of women in higher science. Of the 3,446 scientists working at the Council of Scientific and Industrial Research, only 632 – or 18.3 per cent – are women. 14. In a week when women scientists have won Nobel Prizes for physics and for chemistry, this is a telling statistic. It is a reminder of the scientific potential of our daughters that we are not adequately harnessing. I realise this is both a social and systemic challenge – but it is our collective responsibility to overcome it. There is a Women Scientists and Entrepreneurs Conclave as a segment of this Festival. I am confident it will consider and find practical answers to this troubling question. 15. On that note, I wish all of you, and I wish the India International Science Festival, all the very best. Keep exploring, keep discovering, and keep inventing!